and as presented in Barnsley’s books (Fractals Everywhere, 1988; The Desktop Fractal Design HandBook, 1989). 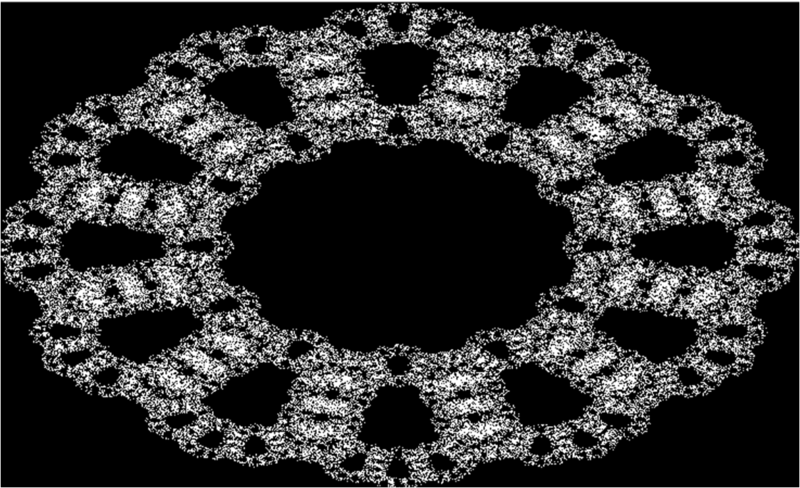 The game was played N = 100,000 times by randomly placing a point within an n-gon (polygon with n vertices), using different combinations of vertices (n) and scale ratios (r), and by coloring in white the emerging patterns. Some combinations produce patterns somehow resembling ancient calendars, medallions, rings,… from different ancient cultures. For the above figure, I used n = 12 and r = 0.30. Running the algorithm by coding the pixels in different colors reveals that the patterns are just the result of partially overlapping the same n-gon across many scales of observations. Did ancient cultures know about this technique? Just for fun, you may want to try with other values, then run searches in Google Images for ancient calendars, medallions, rings, etc and compare results. Share your images and let me know if you found something interesting. I’m documenting results.